As many of you know, the Aquaman/Justice League crossover "Throne of Atlantis" is somewhat controversial among the wait-for-trade circles, in that each collection includes five of the same issues and only two independent of the other. The Justice League trade, at least, includes five of its own issues and two Aquaman issues; the Aquaman trade has four Aquaman issues to three Justice League issues, almost half-and-half. I was disinclined to buy Aquaman Vol. 3: Throne of Atlantis given that there were only two issues I hadn't read, but I did want to read those issues as I gear up for Trinity War (itself its own collecting controversy) and Aquaman Vol. 4: Death of a King, and fortunately a friend had a copy to lend. As it turns out, those two issues factor into "Throne of Atlantis" significantly enough to offer a considerably different reading experience than reading the crossover through the Justice League Vol. 3 book. To that end, this review might more accurately fit in our "Uncollected Editions" series, as a look at the two issues original to Aquaman Vol. 3, Aquaman #0 and #14. Those who have read "Throne of Atlantis" already will immediately understand the significance of Aquaman #0 and #14 focusing on Atlantean advisor Vulko and Aquaman's brother, the Ocean Master Orm, respectively. These are "Throne of Atlantis"'s ultimate "villains" (each, in good Geoff Johnsian fashion, somewhat misguided and working for what they believe to be noble causes); whereas the reader meets them for the first time in the thick of things in the Justice League book, their earlier appearances in the Aquaman book give each more depth before all the chaos starts. The Zero Month issue, introducing Vulko, is arguably the slightly more important of the two. Ocean Master has and always will be "villain-y," but Vulko has previously been Aquaman's friend and adviser, a kind of Alfred to Aquaman's Batman (which makes Johns's evil turn for the character really quite ambitious and shocking). I was caught quite off-guard while I was reading the Justice League title when Vulko suddenly appears; Johns introduces Vulko in the Aquaman Zero Month issue and then only gives him a short scene in issue #14, so to read Aquaman Vol. 2: The Others and then Justice League Vol. 3, one would have no idea Vulko existed; Ocean Master does at least get a mention in Aquaman Vol. 2. Vulko is also an interesting choice for a villain because unlike those with flashier names like Black Manta or Ocean Master, I doubt Vulko will become one of Aquaman's "rogues"; rather, again, Johns breaks considerable interesting ground in making Vulko central to a story probably for the first and last time. Given the grandfatherly role Vulko takes in the Zero Month issue, it's almost unbelievable that he's become a mass murderer by the end of "Throne of Atlantis"; at the same time, this helps to reinforce a point that Johns makes especially well in this crossover, that the Atlanteans are considerably different from humans in terms of their understanding of the world and how they react when something isn't going their way. In the Zero Month issue, Johns picks up where he left off telling Aquaman's origins in volume two, The Others, even echoing a flashback scene as he often did in Green Lantern. Very slowly, Johns is filling in the pieces of Aquaman Arthur Curry's life from the time he first visited Atlantis to the present day; when Aquaman meets Vulko, we find out how he learned the location of his trident and other Atlantean artifacts, though still to be explained is how Aquaman joined with the Others before they found those artifacts. Johns only has one more volume of Aquaman before he leaves the series, and I admit I'm concerned he may not finish the origin story, and no offense to new writer Jeff Parker but I'd prefer to see Johns finish what he started than to have another writer take the origin their own direction. Issue #14, the Ocean Master issue, is equally interesting because it presents Orm as fairly calm and collected, offering another side of the character in contrast to his "Throne of Atlantis" belligerence. Again, as is Johns's wont, Orm is a pretty good king of Atlantis, dismissing in the beginning the superstitious persecution of a child (and not just any child, but the pre-Flashpoint Aqualad, Garth), and it's only action he perceives as rational that make him a villain. Seeing this other side of Orm helps to underscore the Atlanteans' real "alien-ess"; Johns demonstrates, even, that the Atlanteans believe they have a peace agreement with the surface world whereas most humans don't even believe Atlantis exists. Pete Woods guest-draws issue #14, and one interesting tic is that he never shows Ocean Master in full, but always in the shadows. This is a curious choice on Johns's part, if that's attributed correctly, because when Ivan Reis does later reveal Ocean Master, there's nothing really new or surprising about the character's design that makes the earlier hiddenness poignant; I wonder if perhaps Ocean Master's design hadn't been finalized when Woods drew him and so shadowing him was the stopgap measure. Another interesting aspect is that Woods draws a ancient Atlantean king in blue armor not unlike Aquaman's 1986 costume, and with Aquaman's trademark pre-Flashpoint beard; the odd implication is that Aquaman might be his own ancestor, but it lead me to wonder if Johns's next story might involve some time travel. A strength of the "Throne of Atlantis" crossover that I didn't quite catch the first time around is a series of television clips at the end, where a police officer calls Aquaman "dangerous." In his second-to-last Aquaman book, Johns has truly brought Aquaman full circle, from a hero most people didn't know and didn't understand, or ridiculed, to one perceived as a fearsome threat. This is probably not the best place for Aquaman to be in as a character, but thematically Johns has done his duty, proving Aquaman both in-universe and out as an A-list powerhouse. The two "original" issues in the Justice League trade mainly focus on Superman and Wonder Woman's relationship; this is also taken up at the beginning of "Throne of Atlantis," so the issues aren't entirely unrelated to the crossover, but still the issues original to Aquaman Vol. 3: Throne of Atlantis are the ones with more resonance to the crossover and flesh out the villains further. It depends, perhaps, on which title you're rooting for, though I think many readers would probably answer "both." 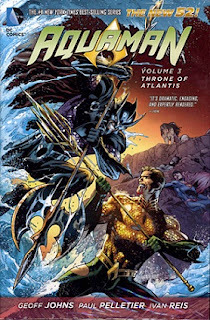 It seems obvious to me that a "Throne of Atlantis" collection ought have included nine and not seven issues, not unheard of, and combined both the Aquaman and Justice League lead-in issues. The difficulty, I imagine, was not one of how to collect, but how to brand. Thus far all the surviving original New 52 titles have had orderly sequential collections, crossovers be damned. I can appreciate this to an extent, but probably at some point a book will need to skip and get a volume three, for instance, when everyone else is getting a volume four. Precedent is already gone with the first New 52 series not to be collected, Green Team, Teen Trillionaires; possibly precedent should have ended earlier with a joint Aquaman/Justice League trade, or with Justice League taking all the "Throne of Atlantis" issues for itself and letting Aquaman Vol. 4: Death of a King be numbered as volume three instead of volume four. Whichever way you slice it, "Throne of Atlantis" still remains a quite engaging crossover. Not unrelated, tune in tomorrow as we discuss the cancellation of the Green Team, Teen Trillionaires collection. Personally, I like the way most DC crossovers are collected. For instance, Trinity war has individual titles collections with a Trinity war collection separate. This way I can buy copies of JL, JLA and JLD and trade hop. However, if I only read one of the titles I could purchase the crossover collection instead. I know this doesn't work for everyone, as not everyone collects every new 52 book. Using this method, I started collecting JLD in preparation for Trinity war, and actually loved it, which turned me on to Constantine, phantom stranger and even pandora. These are books I would not have bothered with previously. So far I've avoided purchasing the death of the family or night of the owls crossover collections because between myself and my fiancé we manage for collect a large chunk of the bat family books anyway. Your argument for having a JL/Aquaman volume 3 rather than 2 collections makes sense, but I think DC, for the most part, is giving us this option with the collected trades in addition to individual volumes. Will DC keep doing this going forward?